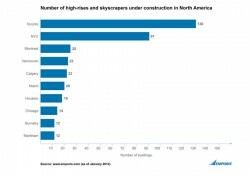 (www.emporis.com), the international provider of building data, of the North American cities with the most skyscrapers and high-rises currently under construction. New York City, the “real” center of North American high-rise architecture, only appears in second place on 91 buildings. Montreal then follows some distance behind on 25 high-rises. Even if the gaps between the top three cities are substantial, New York has in fact been making up ground: Since 2012, the city has recorded a growth in high-rise construction projects of 26% – while Toronto’s numbers have receded slightly. While 2012 saw over twice as many high-rises under construction in Toronto than in the “Big Apple”, the gap is now only just under a third – and the trend seems to be continuing: “On the basis of current developments, we assume that New York will catch up with Toronto as early as 2015,” says Matthew Keutenius, Senior Data Analyst at Emporis. There is one aspect, however, that is common to all the cities in the ranking (with the exception of Houston): The majority of the high-rises under construction are residential buildings. In Toronto, Burnaby and Markham the proportion is 92%, and it is at least 65% in the others. It is notable, too, that current residential high-rise construction in Canada comprises almost exclusively condominiums, while in the USA it includes a relatively large proportion of rental apartments. By way of example, in Chicago, 80% of the residential high-rises currently under construction are to contain rentals. The sole exceptions to the U.S. trend are the cities of Miami and New York, where the residential towers currently underway will offer condominiums in 69 and 54% of cases respectively. 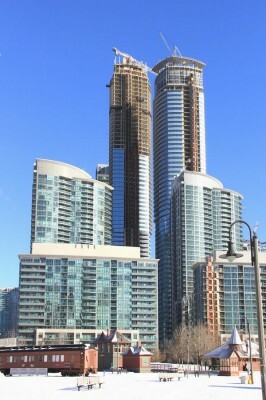 Despite Toronto’s significant growth in terms of high-rises, set to become clearly noticeable on the city’s skyline in the coming years, New York remains the city with the most completed high-rises in North America: As of today, 6,069 of these structures reach for the sky above the “Big Apple” – three times as many as in Toronto. former as multi-story buildings of at least 35 meters’ height, or of twelve to 39 floors if the height is not known. High-rises of 100 meters or more, or that have at least 40 stories, are categorized as skyscrapers. L Tower’s “topping out” ceremony marks the completion of the skyscraper’s skeletal structure and almost half of its glass-and-steel façade. 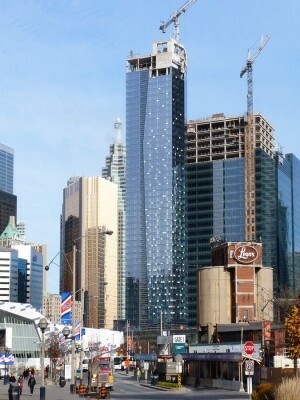 The 58-storey condominium building will welcome residents in 2013.